The vines ate planted in the southern part of the Saint-Aubin appellation bordering the Puligny-Montrachet and close to the grand cru Montrachet appellation. The south facing, 340 metres above sea level, mid-slope position is ideal for grape ripening. The soil very limy with underlying rock, very near the surface which pushes the ground up into formations called “dents de chien”. These Chardonnay vines were planted first on an isolated piece of ground in 1946, with subsequent plantings in 1964, 1972, 1990, and finally 1997. Primary fermentation in barrel (25% new) and aged sur-lie for 10-12 months with occasional lees stirring before racking and bottling The Saint-Aubin 1er Cru “Murgers des Dents de Chien” is is bright in the glass with green highlights. 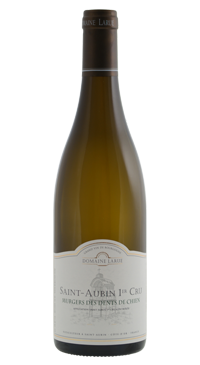 The palate is round and complex with ripe stone fruit and lots of minerality due to to soil. This wine can be drunk young, but will develop further to be enjoyed 4 to 10 years after the vintage.